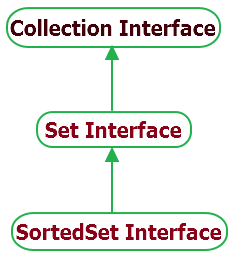 SortedSet interface extends Set interface in collection framework of java. As name suggest, It provides total ordering on elements of Set. Set elements will be ordered using their natural ordering or using a comparator interface. All the elements entries of SortedSet must implement Comparable interface. All the elements of SortedSet must be comparable. So e1.compareTo(e2) must not throw ClassCastException. In collection framework, TreeSet class is an implementation for the SortedSet interface. Few important and useful methods of SortedSet Interface are as bellow. Comparator comparator( ) : It will return the comparator which is used to order the elements in invoking set. If elements of set are ordered using natural ordering then it will return null. Object first( ) : It will return the first element from the set. SortedSet headSet(E toElement) : It will return those elements from SortedSet which are strictly less than toElement. toElement will be not included. Object last() : It will return current last element from the set. SortedSet subSet(E fromElement, E toElement) : It will return set of elements from SortedSet starting from fromElement to toElement. fromElement will be included but toElement will be excluded. SortedSet tailSet(E fromElement) : It will return set of elements starting from fromElement. Usage of above SortedSet methods is described in below given example. // Create the sorted set. // Add items to the sorted. // Iterate over the elements of set and print. //Get first item from set. //Get last item from set. // Using subSet method to get items from given FROM and TO elements of set. // TO element will be excluded. // Using headSet method to get heading items from given item. // Using tailSet method to get tailing items from given item. // Check which comparator is used to sort elements. // If return null then it has used natural ordering.